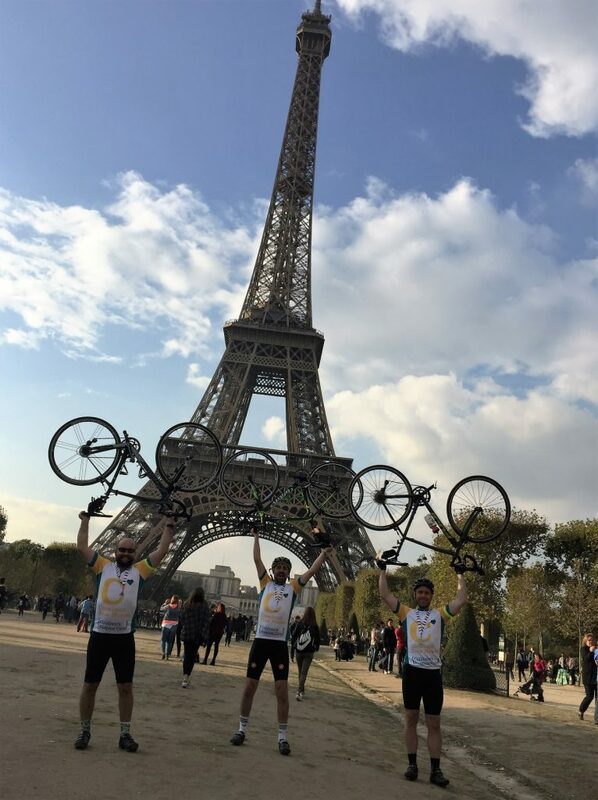 Last week Neil, Hicham and Fitz took part in a 200 mile cycle from Arundel to Paris to raise money for the Chestnut Tree House Charity. Hicham shares his experience here. Off to Chestnut Tree House we go to meet the other riders and organisers to get briefed and more importantly meet the staff and children at Chestnut Tree House. The tour around the house was very eye opening and made us appreciate, even more so, the hard work and effort that goes into keep a self-funded home open. The home was amazing. The reason I call it a home and not a hospital is because if felt homely and everything has been carefully designed and laid out to make it feel as comfortable as possible for the children and their families. The best part of the home for me was the sensory room; you could of spent hours on end in there relaxing. We then headed off to the start line to meet the rest of the team and Chestnut’s charity patron Sally Gunnel OBE DL, who got everyone geared up and ready to go. I think we were all a bit nervous to be riding with Sally but after meeting her we all found her to be the kindest and most down to earth person. She took her time to get to know everyone and kept everyone motivated at the start line. I would also like to mention Sally’s best friend Emma Rogers who kept everyone highly amused from day one all the way to the finish line and the trip home. 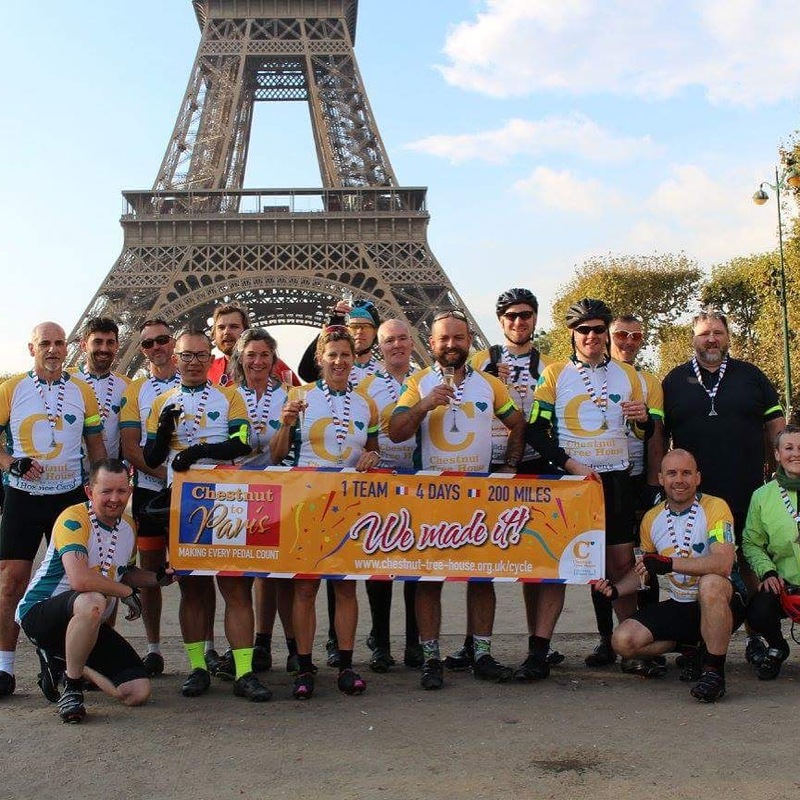 With a big cheer from all of our family and friends we set off for the first 40 miles to Portsmouth where we caught the overnight ferry to Caen. Some of us were not so sensible and had a few to calm the nerves. A nice early start for our first big 90 mile ride through the sleepy French villages. We had a short cycle along the river L’orne where we had breakfast at the Pegasus bridge café, famous for being a key part in the allied invasion of Normandy. From there we headed into the majestic French countryside and quaint rural villages to our lunch stop in the town of Thiberville. Here we had a chance to take a well-earned rest and enjoy some food to get our energy levels back up. us ride through some beautiful country sides taking on some challenging hills, which also brought some fast descents through some ancient woodland. We ended at our overnight stop in the town of Evreux. An early night was needed for all. We began the day with a hearty breakfast feeling excited that this was the final 70 miles. After breakfast, with a big cheer from everyone we all headed east towards a town called Garennes-sur-Eure for our first water stop. We then continued through some beautiful classic French towns such as Montchavaux, before our lunch stop at Courgent. Spirits were high as we were getting closer to our final destination. From lunch we headed towards Paris along some fast open roads and some long hills to our next water stop, where everyone was eager to get going again. We knew that the end was near. We made a quick stop on the outskirts of Paris for everyone to regroup so that we could all cross the finish line together. We then set off again where we were lucky enough to enjoy some relatively traffic free routes through the suburban boulevards until we hit the hustle and bustle at the Arc de Triomphe. I don’t think many of us got to see much of the amazing landmarks as our eyes were fully focused on the road ahead at this point. Our finish line was positioned right next to the Eiffel Tower. We were welcomed at the finish line by family and friends and the event organisers with a big refreshing glass of champagne.